 A tea estate in China. 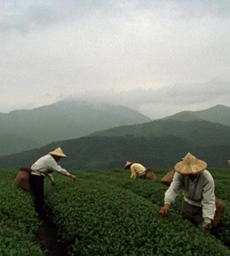 While China is the world’s largest tea-producing nation, it keeps most of what it grows for its own consumption. (photo courtesy The Meaning Of Tea). 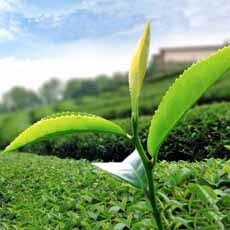 The top three leaves of the bush, called “two leaves and a bud,” are the only leaves used in premium tea (photo courtesy Tea USA). Depending on where it’s grown, the same Camellia sinensis plant yields teas with different flavors, aromas, and colors (photo courtesy National Honey Board). January 12th is the first-ever National Hot Tea Day, declared by the Tea Council of the USA, a trade association. In the Assam region of northeast India, the local variation, Camellia assamica was found to produce a finer leaf tea in that environment. Herbal teas, discussed in the fifth bullet below. Whether tea is black, oolong, green or white depends on how the fresh leaves of the tea plant are processed after they are plucked; most importantly, their level of contact with oxygen. During oxidation, the tea leaves undergo natural chemical reactions that result in distinctive color and taste characteristics. 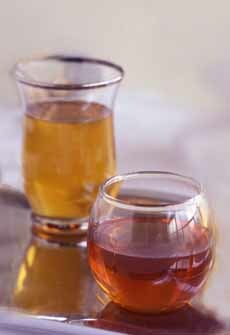 Black tea is allowed to oxidize for two to four hours. Green tea is not oxidized at all—the leaves are steamed, rolled and dried. Oolong tea falls somewhere between green and black teas, in that the leaves are only partially oxidized. White tea is not oxidized at all, and in fact, is plucked in the spring before the leaf buds even unfurl. Herbal teas do not come from the tea plant Camellia sinensis, but are an infusion of various leaves, roots, bark, seeds or flowers of other plants. While they lack the caffeine of tea, they also are not associated with any of the potential health benefits of traditional teas. Tea is grown in thousands of tea gardens or estates around the world. Along with wine grapes, coffee, cacao beans and other agricultural products, local soil and climate result in corresponding flavor, aroma and color variations (photo #3). As with coffee, each tea takes its name from the area in which it’s grown, and the areas in turn are known for their distinctive and uniquely flavored teas. Tea is also divided by grades, determined by leaf size. Smaller sized leaves are used in tea bags while the larger sized leaves can be found in packaged loose tea. While China is the world’s largest tea-producing nation, it keeps most of what it grows for its own consumption. The second largest consuming nation, India, is the largest exporter, followed by Sri Lanka, Kenya, Indonesia, Japan and Taiwan. The largest importing nations are the United Kingdom, Australia, Canada, Russia, the United States and The Netherlands. As with all foods, you can buy the average, the sublime, or something in-between. If you love a good cup of tea—or a tall frosty glass of iced tea—you’ll appreciate the difference between fine, “gourmet” tea made from top quality whole leaves and mass-marketed tea bags produced from bits and pieces. A tip: When you buy higher-priced teas, first taste them plain, without milk or sweetener. The finest teas should be drunk black (plain) to appreciate their nuanced flavors and aromas.